A piano keyboard with the names of the white notes labelled. A little bit of physics to get us started. A musical note, physically speaking, is a roughly periodic variation of air pressure. By Fourier analysis, we know that such a variation can be broken down into sinusoidal components with different frequencies. The frequency that dominates this decomposition is called the pitch of the note, and it is the main thing that we perceive about the note. (The human brain seems to be rather good at Fourier analysis!) For example, the A above middle C is generally taken to have a frequency of 440 Hz. For our purposes, then, a note is simply a real number corresponding to the frequency; the higher this number, the higher-pitched the note. Examples of sound waves (left) and their corresponding frequency spectra (right). Click on the image for the source page and .wav files of these sounds. Very few people can accurately identify the absolute pitch of a note (this ability is called perfect pitch), but almost everyone can detect relationships between notes, whether they’re played consecutively or concurrently. The most fundamental of these relationships is when the pitch of one note is precisely twice that of another: in this case, it is said to be an octave higher. The octave relationship is so fundamental that when we discuss scales we will give the same name to two notes which are separated by one or more octaves — for example, the lower and upper Cs in the first paragraph. It is possible to write tunes that do nothing except bounce up and down between notes an integer number of octaves apart, but these tunes are not terribly exciting. To write more interesting music, we need to choose some additional frequencies that lie between our original ones: in other words, we need to build a scale. (We will refer to these original notes, such as C in the first paragraph, as the tonics of our scale.) Ideally we would like these additional notes to have the following properties. First, there should be plenty of ways to choose two notes from our scale that sound good together. Second, our scale should allow us to work our way up the octave from tonic to tonic in a regular manner. It turns out that we have to make compromises between these two properties, and this is where the mathematical interest comes in. On the whole, notes that sound good together seem to have frequencies that are rational multiples of each other. After the octave, the most “natural” combination of notes occurs when the frequencies are in the ratio 3:2, in which case the notes are said to be a (perfect) fifth apart. (We will refer to the ratio of frequencies between two notes as the interval between them; and yes, the terminology is unhelpful!) This is — approximately, at least — the interval between two adjacent strings on a violin, or between C and the G above it on the piano keyboard. Another ratio that seems to be easy on the ear is the major third, where the frequency ratio is 5:4. Musical instruments are probably as old as human civilisation, but the first known attempt to construct a scale on mathematical principles seems to be due to the ancient Greeks, and is often attributed to our old friend Pythagoras. The approach is to start with the tonic (which we will take to have frequency 1 in some suitable units) and then to increase the pitch by a fifth each time. This would of course rapidly overshoot the octave, so when a new note is formed we divide its pitch by two as many times as we need to find ourselves back in the original octave. (Remember that, as far as the ear’s sense of harmony is concerned, two notes an octave apart are essentially the same note.) So, denoting the ith note we construct by , the construction proceeds as follows. Go up by a fifth: . This is less than 2, so we’re fine. Go up by another fifth: . This is greater than 2, so we reduce it by an octave to get . Go up by another fifth: . Go up by another fifth, and again reduce by an octave: . The seven notes we have constructed form a scale known as the Lydian mode. Arranged in increasing order, they are , , , , , , , and they correspond — again approximately — to the notes F G A B C D E on the piano. It would be nice to repeat this process and complete the octave, so we try going one step further along the sequence: . If we want to complete the octave so that , then the interval between and has to be rather smaller than a perfect fifth. This difference is easily audible, and is an example of a wolf interval — a dissonant noise that sounds to the imaginative like the howling of a wolf. The usual solution that has been used in “classical” music for roughly the last 200 years, and that is also widely used in genres such as jazz that have roots in the classical tradition, is called equal temperament. The idea here is to split the octave into equal intervals, so that the ratio of frequencies between two successive notes is , and we have . We would like not to be too large, since the smaller the intervals between notes the harder they are for the human ear to distinguish; but we would also like to be able to approximate the most harmonious intervals — in particular, the perfect fifth — closely enough that only a very sensitive ear will detect the approximation. In other words, we want to find whole numbers and such that exactly, and to a fair degree of accuracy, i.e. . This will correspond to fitting a total of (approximate) fifths into octaves, for some whole numbers and . How can we do this? The better the approximation to , the more closely we will be able to approximate the perfect fifth within our scale. Now, is an irrational number so we will never be able to express it exactly as a fraction, but there are, obviously, many ways we could approximate it. How do we decide which of these ways are most appropriate? To do so, we need to define more tightly what we mean by the most appropriate approximation. Definition: is a best approximation to if, for any and such that and , it follows that . In plain language, is a best approximation to if any closer approximation must have a denominator larger than . (For example, the rational number is not a bad approximation to , but it is not a best approximation because there is another rational number, , which is a closer approximation and which has a smaller denominator.) In the musical context, we don’t want to split the octave into intervals if we can approximate the perfect fifth better by using a smaller number of intervals — this would certainly be a waste of effort! Fortunately, there is a branch of mathematics that will enable us to develop best approximations in this sense, not just to but to any irrational number: the theory of continued fractions. A digression follows, but it’s worth it. We don’t have space here to go into the theory of continued fractions in any detail — which is a shame, because it is beautiful stuff. The interested reader is referred to the book by Khinchin (1997): the first two chapters contain all the results we will need, and need no more than first-year mathematical knowledge to follow. For now, we will merely give some (slightly informal) definitions and then a result without proof. which we will denote by . We will take all the terms for to be positive integers, and we will not worry for now about the properties required to ensure that this infinite expression converges meaningfully. The first important result for us is that any irrational number can be represented by a simple continued fraction in exactly one way. It is easy to construct the elements systematically. Given the irrational number that we want to write as a continued fraction, we have , where the brackets denote the usual floor function (the largest integer that is smaller than or equal to ). We can now write , where and can be written in continued fraction form as . But now , and we just keep on repeating the process to find as many terms as we like. The convergents of a simple continued fraction are the numbers we get by terminating the expansion after a finite number of terms. We write the ith convergent as where and are both positive integers. It is easy to show by induction that for , we can calculate the convergents by the recurrence relations and . Now we can state the crucial result that we need to construct our musical scales. Theorem. Every best approximation, in the sense defined above, is a convergent of the continued fraction. The next convergent gives us and a 41-note division of the octave; the error in the fifth is then about . The next again gives us a 53-note octave and an error of about . Remarkably, the first proposal for a 41- or 53-note octave seems to have come from a Chinese scholar named King Fang, in about 40 BC, and it’s been rediscovered several times since. (A 53-note musical instrument called the Enharmonic Harmonium, designed by R. H. M Bosanquet, was exhibited in London in 1876, and can apparently still be found in the Science Museum. The designer’s own description is also available online.) The next convergent, by the way, would lead to a 306-note scale. As far as I know this has never been seriously proposed by anybody. Although the search for an optimal scale has interested scholars for millennia, it is only in the last couple of centuries that it has really standardised. This is partly because many instruments allow the musician to “bend” the pitch of notes slightly away from their theoretical value in order to improve the harmony: on a fretless stringed instrument such as the violin this can be done simply by shifting the fingers slightly, and on many wind instruments it can be done by careful (or careless) use of the embouchure or a mute. The ancient Chinese interest in equal-tempering may be connected with their use of bells and lithophones (the stone equivalent of xylophones), neither of which permits this kind of cheating, and European interest seems to have developed with the rise of keyboard instruments such as the harpsichord and the piano which could be tuned to any scale system but then had to remain in that system throughout the piece. We’ll now look briefly at one of these sets of conventions, just tuning. A just tuning is a scale that is constructed, so far as possible, from primary intervals, i.e. those that are most appealing to the human ear: the octave, the perfect fifth (the frequency ratio 3:2) and the major third (the frequency ratio 5:4). The idea of a just tuning is that every note is related to at least one other note by an exact primary interval. 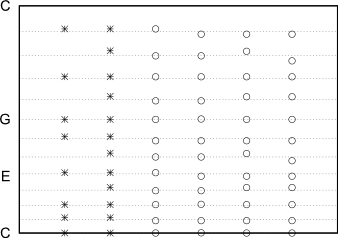 A paper by Silver (1971) provides a nice way of visualising just tunings. We set out the pitches on a grid: a node of the grid corresponds to a pitch; a horizontal step to the right means an increase of a perfect fifth, and a vertical step up means an increase of a major third. To construct a just tuning on twelve notes, we select a set of adjacent grid points that includes all the twelve notes of the chromatic scale. For example, the figure below illustrates the Pythagorean tuning in which we simply increase by a perfect fifth every time (decreasing by an octave whenever appropriate). Note that this choice defines what we mean by C, D and so on relative to what we pick as the tonic of the scale. If we were to select a set from the above figure that included two notes labelled as (say) F, these two notes would not be an integer number of octaves apart (because. as we’ve noted, there is no way to obtain a power of 2 by multiplying powers of 3/2 and 5/4). Thus, if we tried to continue this scale by increasing by another perfect fifth, we would not land back on C. Instead, we have an imperfect interval from F to the C above it — sometimes, as we’ve seen, called a “wolf interval”, and sometimes called a Procrustean fifth after the charming Greek blacksmith who cut off his guests’ feet to ensure they fitted properly in the bed. 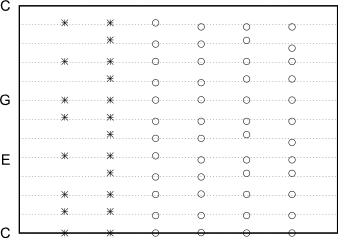 According to Silver (1971), there are 43 three-row patterns, 55 four-row patterns and 8 five-row patterns. You might like to try constructing and counting these systematically for yourself. You might also like to visit the Wikipedia page on just intonation, which has some audio files that compare equal- and justly-tempered tunings, and see whether you can detect the difference! In case you can’t hear the differences between these different tunings, the figures on the left illustrate them graphically. The y-position of each note corresponds to its frequency relative to the bottom note (the tonic). Note that, as they’ve been constructed to, all these tunings agree closely on the perfect fifth (G), but there is more variation for other notes — most noiceably (two steps below top C) and F (one step above E). One can imagine the dissonance that would result if two instruments tuned to the fifth and sixth systems in these figures attempted to play in harmony — in fact, anyone who’s been in an amateur choir or a school music class probably doesn’t need to imagine it. It’s also noticeable that in the Pythagorean system every note except C and G is slightly sharper (slightly higher) than in the equal-tempered system, while most other just tunings contain a mixture of sharper and flatter notes. This brief tour of musical scales has, with any luck, thrown up more questions than it answers. Not all these lie within the province of mathematics. For example, why should the human brain find certain simple mathematical relationships between sounds appealing, and find others unappealing? Why should we even be able to identify the pitch of a note among the jumble of frequencies that make it up? Mathematically, you might like to think about whether it’s possible to compute the numbers of possible just-tunings without listing them all (and once you’ve done it for 12 note systems, try for 41- or 53-note systems…) Then there are other aspects of music in which one can immediately spot a mathematical element: rhythms and chord progressions, to name just two. Leibniz famously wrote in a letter to Goldbach that “Musica est exercitium arithmeticae occultum nescientis se numerare animi”– “music is the pleasure the soul experiences from counting without being aware that it is counting”. The remarkable thing is just how much more than just counting is going on when we listen to music, and just how unaware we are of most of it! It solves a lot of doubts for anybody mathematically oriented that likes music too.Thanks a lot for taking the time to write it. Excellent article!! Thank you for writing this! it should be r^k = 2. Thank you! I’ve corrected the typo. Kids in modern world should receive the most effective education they deserve. They are capable to perceive information faster, with cross-modal processing,activating all senses at once : visual perception, audio analyzers , neuromotor functions.